As part of my recent sketch survey, someone asked if I could provide them with Disney Princess Scrapbook Layout Ideas. Not being one to turn down a challenge, especially since I live in a testosterone-filled house, I put my thinking cap on and got to work. It's actually fairly easy. Let's take a look at the "classic" princesses one at a time. Her ball gown is a made of shimmering shades of blue. To replicate this shimmer, try using Bazzill Basics new line of shimmering cardstock - Bazzill Bling. The "Prince Charming" multi-pack is a perfect mix of blues to match any pictures with your little Cinderella. It's interesting to note that when you take a close look at all the princesses there is a surprising lack of jewelry, but that doesn't mean you can't embellish your layout with a little something sparkly like jeweled or pearl brads. It would be a nice touch to put them in a swirl pattern to mimic her transformation from "rags to riches." If you want something a little easier, you could also use Heidi Swapp Jewel Art. She makes jeweled frames, word art and embellishments. And let's don't forget Cinderella's glass slipper. To create a glassy effect on your page, use clear epoxy stickers, page pebbles or clear embossing powder. If you just want a little shimmer on your layout, you can still use Bazzill Bling cardstock in "Glass Slipper." For all the digital scrappers out there, these are the hex codes for Cinderella - 7fc2ed (dress blue), a1dcff (sleeve blue) and f4c724 (hair). Aurora's dress, like Cinderella's, is very monochromatic, but is on the other side of the spectrum in varying shades of pink. So, similar to Cinderella, you can use the Bazzill Bling "Diva" multi-pack and marry that with gold embellishments to match her gold crown and hair. Again, as you can with Cinderella, use jeweled art to create swirls to represent the presence of the three good fairies. One way to design your layout is to use a lot of lines. If you look at Aurora's dress, there are a lot of darts in the bodice and pleats in her skirt, which gives her the dress a very linear (vertical) look. But, as she was cursed with a sleeping spell, offset the vertical lines with horizontal ones. You can either use ribbon or patterned paper (I like to use half-inch strips) to create the lines. Lastly, since she was named "Briar Rose" while in hiding, you could do something completely different and make the focus of your layout roses. And last, but not least, these are the hex codes for Aurora - c51864 (dress dark pink), e674a8 (dress medium pink), f6a8c2 (dress light pink) and ffc729 (hair). Of all the "classic" princesses, Snow White was one-of-a-kind. She was always my favorite, probably because she has dark hair like me. Her dress is also quite different from both Cinderella and Aurora. Instead of having a monochromatic look, her dress is high on contrast featuring the three primary colors - yellow, blue and red. But just because she doesn't "seem" as girly, doesn't mean you can't create a scrapbook layout suitable for a princess. As Snow White has bouffant sleeves and a scalloped petticoat, you can use Bazzill Basics scalloped edge cardstock or you can make your own using edging scissors. 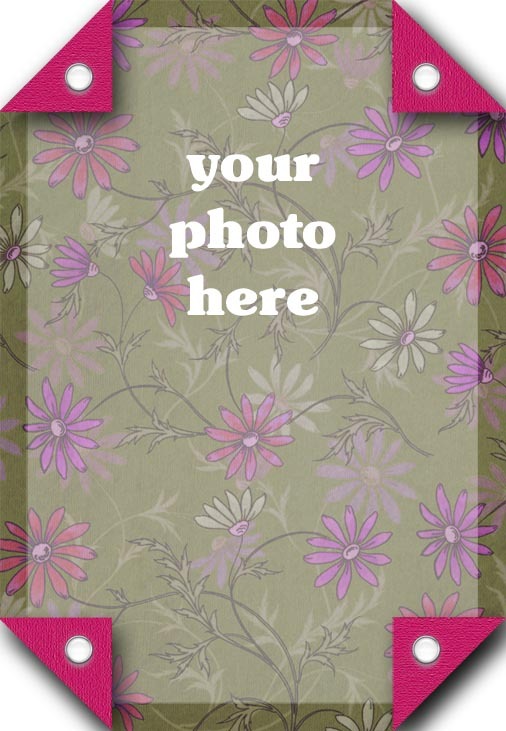 And to replicate her dual-colored sleeves, use double-sided cardstock to create some great photo mats where you fold up the corners and then secure them with brads. If you're looking to create a digital scrapbook layout of your little Snow White, here are the hex codes for her dress - ee3857 (sleeve red), 70a7d2 (sleeve blue), 015ea8 (bodice blue) and fde67c (skirt yellow). As you can see, my Disney Princess Scrapbook Layout Ideas, like a lot of my others, tend to focus on "non-traditional" approaches to creating scrapbook layouts. I say non-traditional in that I'm not going to point out the obvious by telling you that you should use Disney Princess paper or stickers, which are a dime-a-dozen. In my opinion, we're all looking to create something a little unique and I hope that I've helped your towards that goal. This is the first in what will be an on-going series of articles for Disney Princess scrapbook layouts. When I actually started looking into the Disney Princesses, and recounting memories of them from my youth, I came up with numerous ideas, which would just lead to the "firehouse effect," if I put them all in one article. 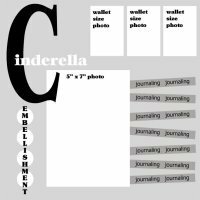 So, stay tuned to my blog for more Disney Princess Scrapbook Layout Ideas and if you have any specific questions in the meantime, please don't ever hesitate to contact me.